This week we have a few books to inspire your Thanksgiving celebration. Even if your menu is set by tradition for you every year, it doesn't hurt just to take a peak at something new. You might actually be tempted to try a new recipe, or perhaps you'll see an idea for a different way of serving something you always make. Perusing one of these books just builds excitement for the arrival of the holiday. The pictures and layout of this book are so inspiring and give ideas for decorations, table settings, and serving ideas. There are plenty of recipes for variations of turkey, stuffing, cranberry sauces, side dishes and desserts such as: Oyster and Mushroom Stuffing, Mashed Butternut Squash with Browned Butter and Sage, Rosemary Bread, and Walnut-Praline Pumpkin Pie. 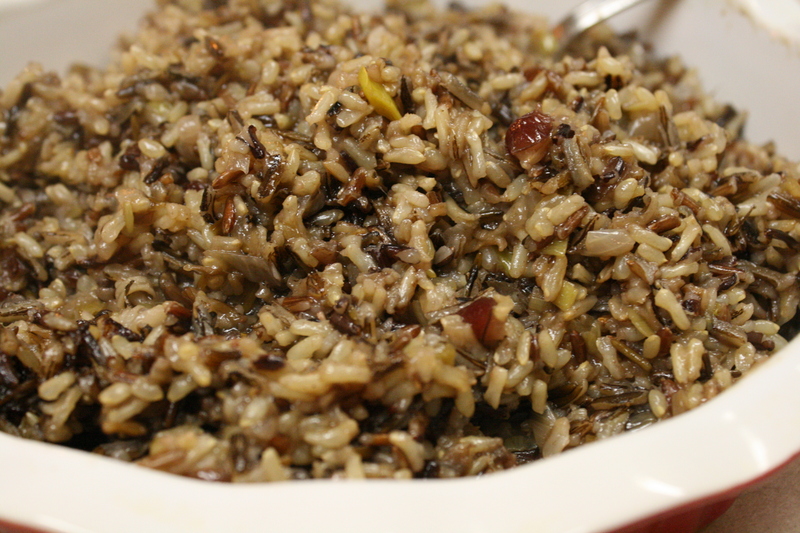 I opted to try the Wild Rice and Leek Pilaf. I couldn't find plain wild rice at my grocery store so I chose a wild rice mixture. I also tried my pilaf in the rice cooker for the final cooking time, but decided I wouldn't recommend that way for the future. Everything seemed to come out too mushed together. I also felt like the leek flavor did not come through strong enough to justify using them. However, rice pilafs are a wonderful idea for variety on the dinner table and this basic recipe can be adapted to whatever suits your family. In a large saucepan over medium heat, warm the olive oil. Add the leek and onion and saute until soft, 8-10 minutes. Add the wild rice, thyme, and salt and season to taste with pepper. Pour in the stock, bring to a boil, reduce the heat to medium-low, cover, and cook until the wild rice is tender, about 50 minutes. Fluff rice with a fork and add in the cranberries or raisins if you are using them. Transfer to a warmed serving bowl and serve hot. May sprinkle with toasted almonds before serving if you wish. There are many choices to try, such as: Portobella Mushroom Bisque, Pumpkin, Leek and Potato Soup, Brined Turkey, Barbecued Turkey, Roast Turkey Breast, Acorn Squash stuffed with Wild Rice, Lasagna with Sugar Pumpkin, Ricotta and Sage, Cheddar and Jalapeno Corn Bread Stuffing, Italian Sausage, Mushroom, and Sage Stuffing, Wild Rice Stuffing, Bread Stuffing with Apples, Bacon, and Carmelized Onions, Walnut Rolls, Carrot Pudding, Creamed Onions, Cranberry Chutney, Pumpkin Pound Cake, Chocolate Gingerbread, and Persimmon Pudding. I chose to try the Chiffonade of Brussel Sprouts. The dish was such a nice combination of colors, textures and tastes that it is destined to become my favorite way of cooking Brussel sprouts. Trim the stem ends of the Brussel sprouts and remove any yellow or spotted outer leaves. Cut the Brussel sprouts into 1/16-inch slices, and use your fingertips to separate the slices into shreds (as much as possible). Alternatively, shred the Brussel sprouts in a food processor. Place in a bowl and set aside until ready to saute. Heat a 12-inch saute pan over medium-high heat. Add the bacon and cook until crisp. Using a slotted spoon, transfer the bacon to a paper towel-lined plate. Set aside. Reserve the bacon fat in the pan. 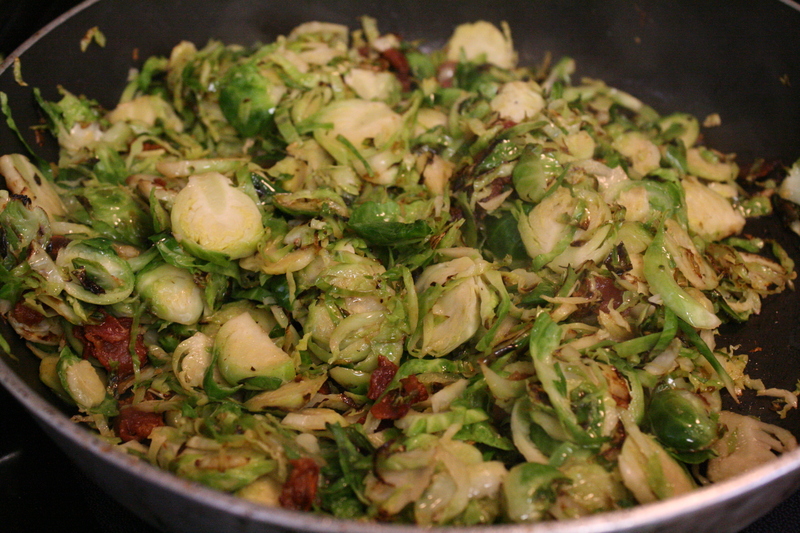 Just before serving, reheat the bacon fat until hot and add the Brussel sprouts to the pan. Saute until crisp-tender and bright green, about 3-5 minutes. add the bacon, hazelnuts, salt and pepper. Mix thoroughly. Taste and adjust seasonings. Serve.